My first impression when flying into Mexico City a few weeks ago was its vastness. From the air, the city seems to stretch forever. The Valley of Mexico has been inhabited for over 12,000 years, and when Hernán Cortés entered it in 1519, its population of 1 million was probably the largest in the world. Today, Mexico City is home to more than 21 million people, twice the size of the second largest Mexican city in the world, Los Angeles. Mexico City is a great destination for tourists, with world-class museums, dining and archeology. Most of my travels are for business, and I was looking forward to being a tourist again. But on my second day in Mexico City, I began to sense a different feeling than what I had been expecting. I realized the discomfort was coming from my iPhone. In the past, a central part of the travel experience was navigating a foreign country in a foreign language. You had to read the street signs, interpret a paper map and ask for directions with either a rudimentary level of language skills or by interpreting universal directional hand signals. Today, your phone will tell you, in your language, where and how to go. Even easier, there’s Uber (or its equivalents). Punch in the destination, and a car arrives in under a minute to take you there. All this is very convenient, and has eliminated the need to speak to anyone. Technology has enabled us to function in isolation, but has also deprived us of the benefits we accrue by making an effort at establishing actual, interpersonal relationships. I realized that it was this lack of interpersonal communication that was the source of my agitation, so I made a conscious effort for the rest of my visit to speak Spanish to as many people as I could. Engaging with people is challenging, especially when there is a language or cultural barrier, but I found the lack of interaction unsettling, and preferred the small discomfort of communicating in a foreign language to the isolation (and convenience) that technology affords. It was walking around Mexico City, trying to frame these thoughts, that led me to wonder if my discomfort was analogous more broadly to modern society. “Only the lonely know why I cry,” sang Roy Orbison. Sadly, loneliness is on the upswing. 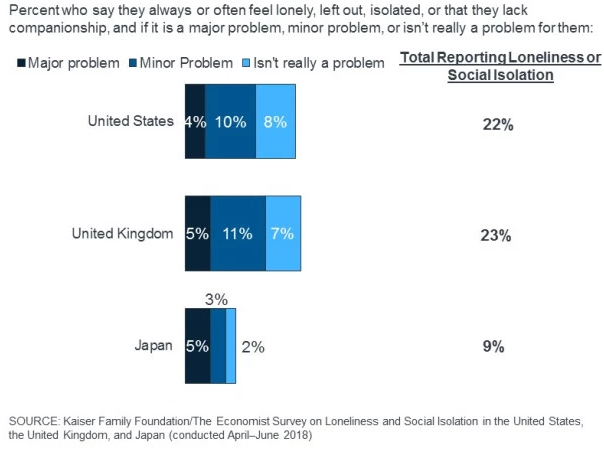 A Kaiser Family Foundation survey last year (https://www.kff.org/other/report/loneliness-and-social-isolation-in-the-united-states-the-united-kingdom-and-japan-an-international-survey) found that nearly a quarter of adults in the US and UK often feel lonely or isolated (see table below). The Japanese have a word, hikikomori, literally meaning “people who shut themselves in their homes.” Juliane Holt-Lunstad of Brigham Young University found that loneliness was related to a 26% higher risk of dying. In response to a separate report, last year the UK appointed a new Cabinet Minister for Loneliness (Tracey Crouch). 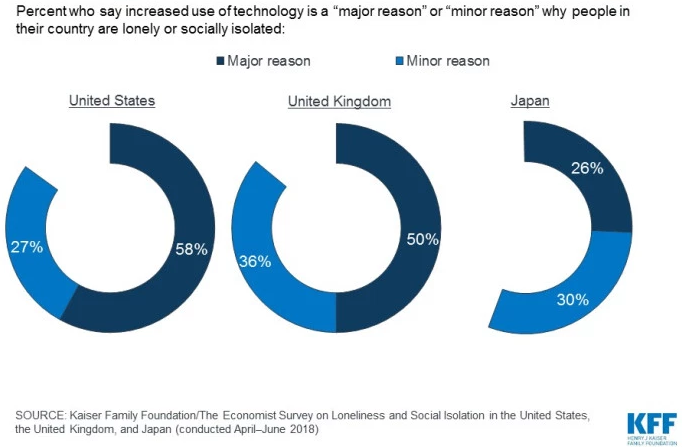 Loneliness has many causes, including economic stress such as long-term unemployment, but a majority cite technology as a contributor (graph below). 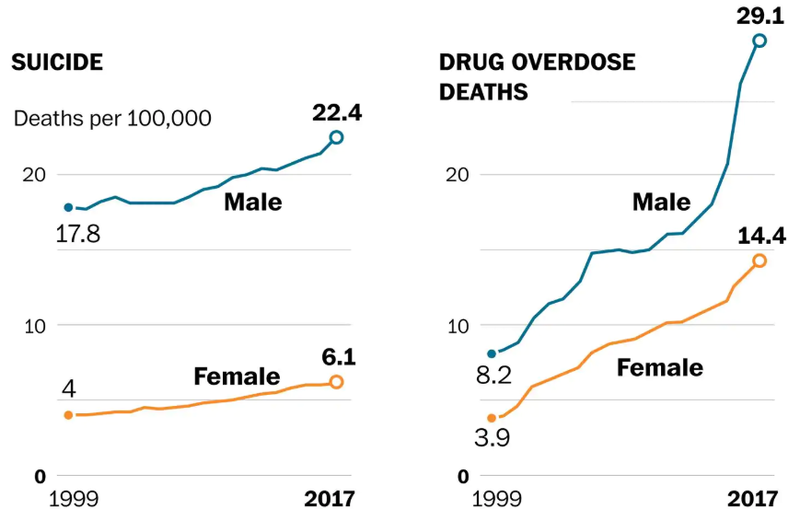 Last year, there were more than 70,000 deaths in the US due to drug overdose, 47,000 due to suicide (see chart below), and life expectancy in the United States declined for the first time since the Spanish influenza epidemic of 1918. I have not seen a formal causal link established between loneliness and these sobering facts, but it is likely there is a relationship. I also wonder if there is a relationship among loneliness, these frightening health data and political polarization. 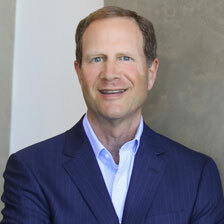 I’ve written before on political polarization (most recently here: https://blog.angelesadvisors.com/2018-investment-symposium-the-intersection-of-politics-and-investing/). As with every sociological phenomenon, there are many causes of this polarization, but it seems likely to me that all these factors (loneliness, deteriorating health and a polarized society) are connected. A contributing cause, I think, is the insidious effects of modern media. According to Pew Research, more people rely on social media for news than read newspapers, and social media services are based on perpetuating past preferences, thus reinforcing biases. Polarization can be (is) very profitable, not only for Facebook, Fox and Google, but for politicians mobilizing their base. A lot of entrenched interests are thus highly incented to exacerbate our divisions. Vivek Murthy, a former U.S. Surgeon General, calls loneliness an epidemic, a major public health crisis. So are suicide, drug overdoses and political polarization. The is no single remedy to any of these crises, but a step forward is recognizing the repercussions of how we use technology (or rather, how it uses us). A little less time with Facebook or Instagram, Fox or CNN, and a little more time with our neighbors seems like a right step for everyone. You gotta take if your lonely heart breaks. Sólo los solitarios. Gracias por su interés.